I made a new bib! This one was a gift for a little sweetheart in California. I made it entirely from scraps from other projects, which was so satisfying! I stamped a piece of twill tape to make a patch. The best part of making and gifting this bib was that it was hand delivered to sunny Southern California. That's where I've been the past week...It's lovely to be so near the ocean. I had a great time but my mind was spinning and I couldn't stop craving the hum of the sewing machine. I took a little baby quilt with me on plane so I would have something to bind during the flight. As soon as I get around to washing it I will share it with you. Glad to be home! *Edited* Adorable GIVEAWAY over at Lovely Little Handmades. Check it out, Kerri is being extra generous! 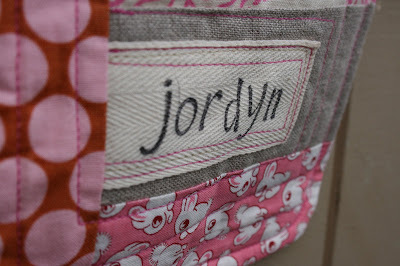 Now that I'm doing bits and pieces of patching, I have SUCH respect for quilted projects! These bibs are gorgeous. I think I've finally given up my hatred of pink! I LOVE this bib. You did a great job with combining patterns, and the twill tape is the perfect finishing touch. Where did you buy your twill tape? I had a hard time finding any that wasn't polyester the last time I tried. It will be a shame to get it all smudged with milk and mashed banana!! What a gorgeous gift! I especially love the stamped twill. What a sweet gift! I love the hand stamped patch. I'm so jealous you were in southern Cali - the beach, the ocean. Welcome back! very cute! looking forward to photos of the finished quilt. did you hand stitch the entire quilt, or just the binding? Adorable! And, welcome back home. 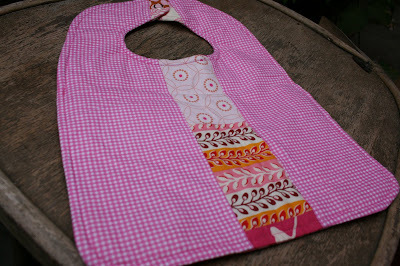 I love the scrappy bib!!! love all the fabrics together and the stitching! adorable bib! 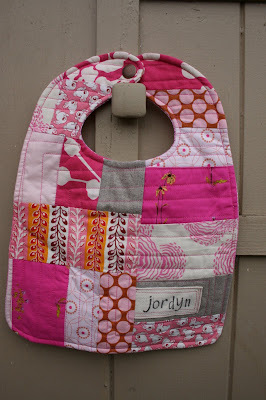 I love the patchwork on this! This is just so cute! The colours are great and I love the way you've put the baby's name on it.